Skirt: Courtesy of LOVE. Shirt: J. Crew. Shoes: Steve Madden. Cuff: Courtesy of Rachel Zoe. Watch: Michael Kors. I got asked how to 'dress an item down' on Tumblr. Good question! I often use a denim/chambray shirt to break up a dressy look or to stop something looking too 'pretty'. Get your hands on a decent denim/chambray shirt- you will wear it with everything. 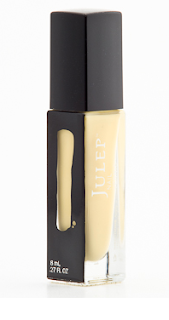 FYI I'm wearing a yellow nail polish called 'Blake' courtesy of Julep. Such a great spring colour.